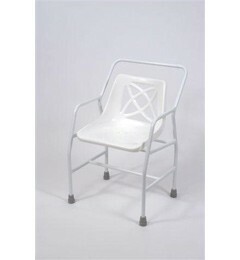 A comfortable shower chair featuring a supportive backrest and fixed armrests for extra safety when showering. Complies to British Standard BS EN 12182:1999 General Requirements to prevent genitalia trap (Medical Device Alert MDA/2003/029). Maximum User Weight: 25 Stone (160kg).